RICHMOND, UK. – December 17, 2018 – Curvature, the world’s largest provider of third-party maintenance and multi-vendor network and data centre IT lifecycle services, has named Don Grantham as chairman of its Board of Directors. Grantham brings an impressive track record of strategic and sustainable business success to Curvature, following years as a transformational leader for Microsoft, HP, Sun Microsystems and IBM. Based in the United Kingdom, Grantham has played a pivotal role in guiding worldwide business expansions for some of the biggest and best-known technology companies. 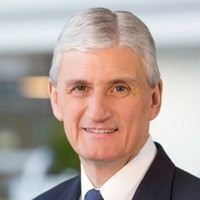 As president of Central and Eastern Europe for Microsoft, Grantham led Microsoft’s business in 33 countries, focusing on the digital transformation of governments, and large, medium and small enterprises in all market segments as well as Microsoft’s Consumer business. Before that, he was senior vice president and chief sales officer for HP and executive vice president of Global Sales and Services at Sun Microsystems. Grantham’s high-tech career began at IBM, culminating in executive management responsibility for server sales in Northern Europe. Grantham has been a non-executive director at Curvature since January 2018. As the global leader in independent IT support, products and services, Curvature is transforming how companies manage, maintain and upgrade equipment and support for multi-vendor, multinational networks and data centers. At a time of competing IT priorities and digital transformations, companies need to be nimble, efficient and smart in how they invest in IT and business innovation. A strategic partner with more than 15,000 organizations globally, Curvature specializes in delivering 24×7 global technical support, advanced hardware replacement, and complete lifecycle management of networking and data center equipment under one global contract from locations in the Americas, Europe and Asia. For more information, please visit www.curvature.com.